Near Lone Pine. ASA participated in a survey sponsored by the Eastern California Museum in September 1957 that located five caves with evidence of recent Indian occupation (Rozaire, 1968). Howe (n.d.) mentions a Waldo Kell. Material from the survey went to the Eastern California Museum (Steele, 1982). 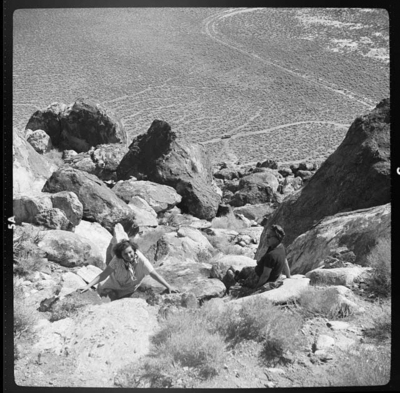 Amazon Hill and Cave, September 28-29, 1957 7 negatives: ASA001-153 – 159 Views taken during ASA survey of the area; basketry from the cave; several women climbing the hill. 2.25x2.25 negatives.